By Erin Biba on May 12, 2014 at 10 a.m. The Earth’s magnetic field is acting pretty wonky right now. That may be an indicator of big changes to come. Or it could just be business as usual. The Earth’s magnetic field is acting pretty wonky right now. That may be an indicator of big changes to come. Or it could just be business as usual. The truth is that the most consistent thing about our magnetic field is that it’s inconsistent over short periods of time (like the human lifespan). But when scientists look at it across millennia, they recognize that its behavior is actually fairly easy to predict if they can just get an accurate measurement. So what, exactly, is going on with the modern magnetic field? I asked Scott Bogue, a geologist at Occidental College in Los Angeles, and one of the leading experts on Earth’s geomagnetism. Turns out, was a bit of a controversial question. First, some background. If you know about the science, it makes sense that our field isn’t the most stable force on the planet. After all, it’s created by conditions in the most volatile place on Earth. The planet’s core is a spinning, stirring, moving glob of really excellent electricity-conducting liquid metal (iron-nickel alloy, to be exact). All the extreme heat energy down there, and the energy created by gravity, gets converted into the movement of the fluid. And energy from that fluid momentum gets converted into electromagnetic energy, which emanates from the core as our magnetic field. The field surrounds the Earth and extends out into space (far enough that it encompasses all our orbiting satellites, but not so far that it reaches the moon). Its most important role is that it blocks particles that shoot down to earth from the sun (solar wind) and faraway stars (cosmic rays) by pushing them away from the Earth’s center and directing them towards the poles. That’s why the Northern and Southern Lights, created when incoming particles from the sun interact with Earth’s atmosphere, aren’t visible to most of the planet’s population. If we didn’t have the magnetic field, we’d see lights all over the Earth. We won’t have Earth's magnetic field forever. We won’t have the field forever. As the core cools and eventually stops spinning, the field will go away. Mars, for example, has a solid, cold core and no field (all of our outer planets -- Jupiter, Saturn, Uranus, and Neptune -- still have fields). Scientists aren’t sure what, exactly, will happen to Earth when our field finally goes away. They think all that solar wind and cosmic rays bombarding us might create a bunch of small holes in our ozone layer at low latitudes. At the very least, we’d probably get a lot more skin cancer. So here’s where the controversy comes in. If field strength continues to weaken at this pace, it will be completely down to zero in a few thousand years. 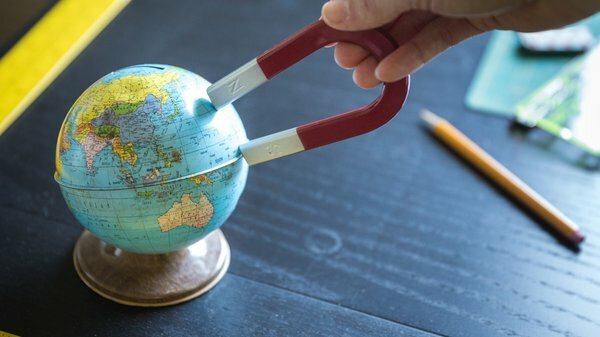 Earth's magnetic field strength has decreased in some areas by about 10% over the last 30 years. But there’s this really weird spot in the ocean off of South America, drifting in the direction of Africa, where the field has actually reversed. It’s called the South Atlantic Anomaly. The reverse is happening deep inside the core, so it’s not enough to make compasses on the surface point in the wrong direction. But it is enough to create a continent-sized weak spot in the field. Here, particles bombarding Earth easily enter our atmosphere and the degradation of the overall field is happening at an accelerated pace. 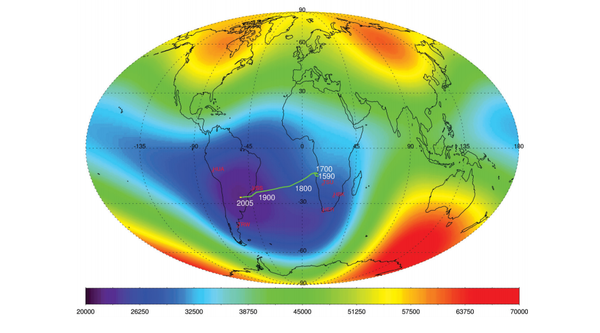 While the Earth’s field has weakened about five percent in the last 200 years, the South Atlantic Anomaly has weakened by eight to ten percent in just three decades. Satellites and other Earth-orbiting objects are more likely to fail when they pass over the Anomaly and astronauts have reported seeing flashes of light when the International Space Station orbit takes them over it -- in both cases because radiation from incoming particles is so much higher without the field’s protection. So, as the Double Rainbow Guy famously said, “WHAT DOES IT MEEEEEEAAAAN?!? !” Well, there’s not a lot of agreement about that. On one side of the argument, geophysicists think this weak spot is a signal that the Earth’s field is about to flip again. After all, it’s been about 780,000 years since the last flip -- well beyond the average. On the other side are scientists who say that this sort of weirdness happens all the time.